This year, “Hot Topics in Education” has been the emphasis for Orlean Beeson School of Education Dean’s Education Council (DEC). The topics of discussion have been identified as crucial current education issues affecting students, faculty, staff, administrators and parents. 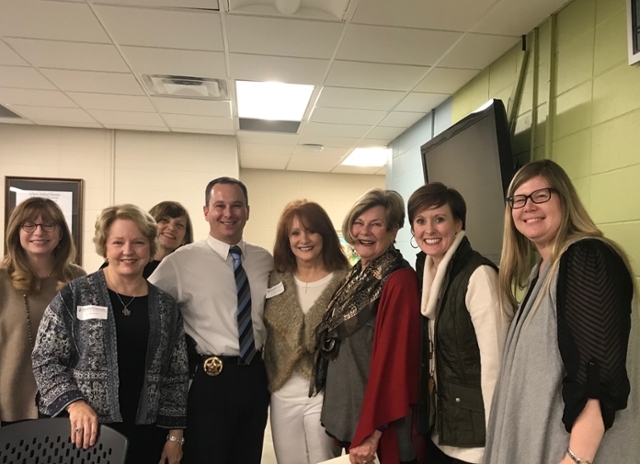 For the January meeting, DEC members were excited to welcome Lt. Clay Hammac, the Commander of Shelby County’s multi-jurisdictional Drug Enforcement Task Force to discuss current drug trends, common indicators of drug abuse and overall drug awareness. “Lt. Hammac and his topic of discussion were especially interesting because drug abuse is affecting not just our school systems but many citizens in America,” said council member Mary Wyatt. Lt. Hammac commands a dozen highly trained and specialized criminal investigators, who specifically focus their efforts on intercepting the sale and distribution of illegal narcotics. A career law enforcement officer, Lt. Hammac has specialized in violent crime investigations, organized crimes, and electronic, financial and white collar criminal investigations. Lt. Hammac has appeared before the United States Congress as an expert witness on the investigative techniques used to track white collar and organized crime networks. Just in the last two years, Lt. Hammac’s team of investigators has made more than 2,000 criminal cases against drug dealers, disrupted more than three dozen organized narcotics supply chains, and taken down five organized criminal enterprises involved in the sale and distribution of drugs throughout multiple states. Lt. Hammac’s presentation covered the areas of current drug trends, common indicators of drug abuse, commonly abused drugs, as well as, prevention and awareness resources. The Council meets quarterly to discuss the “Hot Topics” and provide the education school with encouragement and direction. In October, they discussed “Facts and Myths Concerning Charter Schools” with Matthew Campbell, Assistant Professor of Education from the University of North Alabama. He was able to clarify questions resulting from the passage of Alabama’s Charter School Bill in 2015. Campbell is a graduate of Orlean Beeson School of Education. For more information on the Dean’s Executive Council or to view current list of members please visit our official webpage. To learn how you can become a member contact Sheri Ransome at shransom@samford.edu.